STAGECOACH has been banned from bidding for three rail franchises, in a clash with the Department for Transport over pension risks. Abellio has been awarded the East Midlands franchise, and will take over from Stagecoach in August. The surprise move by the Department for Transport means that Stagecoach is now also off the franchise shortlists for Southeastern and the key West Coast Partnership, which is set to be the launch contract for HS2. Stagecoach shares fell after the announcement and were down 4.28p, just over 3 per cent, by 08.45. They then staged a slight recovery but began to give ground again before midday and went on down during the afternoon, closing 9.3 per cent lower at 120.9p. The DfT said Stagecoach had lodged ‘non-compliant’ bids for all three franchises. A spokesman for the Department said: ‘Stagecoach is an experienced bidder and fully aware of the rules of franchise competitions. It is regrettable that they submitted non-compliant bids for all current competitions which breached established rules and, in doing so, they are responsible for their own disqualification. There had already been reports that franchise-holders were uneasy about their liabilities for pension funds, and it is pensions which have provided the spark now. Stagecoach Group chief executive Martin Griffiths said: ‘We are extremely concerned at both the DfT's decision and its timing. The Department has had full knowledge of these bids for a lengthy period and we are seeking an urgent meeting to discuss our significant concerns. ’We have drawn on more than two decades of rail experience and worked in partnership with local stakeholders to develop high quality proposals to improve each of these rail networks. ‘We bid consistent with industry guidance issued by the Rail Delivery Group and shared with the DfT. Without ongoing Government support for the long-term funding of railway pensions, The Pensions Regulator has indicated that an additional £5 billion to £6 billion would be needed to plug the gap in train company pensions. Meanwhile the new East Midlands franchise, which starts on 18 August and runs until 2027, will include new fleets and trials of hydrogen fuel cell trains, the DfT said. There will be 80 per cent more seats on morning peak services to London, Nottingham and Lincoln, while the half-hourly electric service between London and Corby will be launched in December 2020. Other features of the new contract include ‘improved’ delay repay compensation and flexipass tickets ‘to provide better value fares’, according to the DfT. London Luton Airport had been pressing for trains to call at Luton Airport Parkway every 15 minutes, but EM trains will call at both Luton Airport Parkway and Luton twice an hour. He continued: ‘Abellio will invest £600 million in improvements to trains and stations, maximising the effect of the Government’s £1.5 billion upgrade of the Midland Main Line, to make journeys easier, more reliable and comfortable. 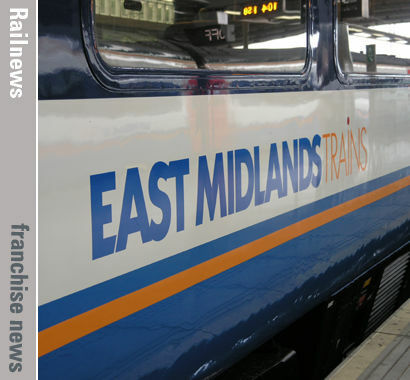 The DfT has not revealed whether the new East Midlands franchise is expected to pay premiums, but in 2017-18 East Midlands Trains paid £58.2 million, plus another £4.5 million profit share, according to the ORR. However, the franchise was effectively subsidised by £128.4 million when industry-standard reductions in track access charges were taken into account.